The release of Sgt Pepper’s Lonely Hearts Club Band 50 years ago rewrote the rulebook of pop music. It’s not that it was the first concept album (in as far as it was even that in the sense we’ve come to understand the idea now), nor the first to dabble innovative studio tricks (The Beatles themselves had done so on Revolver, and Brian Wilson was perhaps even more innovative at the time). But for contemporaries, the album changed everything. Perhaps it was also the cover that had such an impact. It was not usual to create artworks for LP covers — the Beach Boys were still goofing about with animals on snapshots for the sleeve for Pet Sounds. One could study Peter Blake’s collage for the duration of Side 1 and while away the inferior second side studying it some more,, and return to it over and over again. Even today, it is a significant piece of 20th-century art. But the thing is, Sgt Pepper’s is greater in its context than it is within the canon of Beatles albums. Of course, there are mighty tracks on it. A Day In The Life is a masterpiece, but I know few Beatles fans whose life would be poorer for the absence of Lovely Rita, or, indeed, Within You Without You (cleverly sequenced to start Side 2, for easy skipability). It doesn’t require clever revisionism by deliberate iconoclasts to regard Sgt Pepper’s as not the greatest album the Beatles made. But it does require the revisionism of fools to call it overrated. Sgt Pepper’s is a great album, especially the first side, and its historical impact cannot be overstated. And if the later rule of already-released singles finding a place on albums had been in force, imagine how much better Sgt Pepper’s might have been with Strawberry Fields Forever and Penny Lane. In the event, EMI insisted on releasing the songs, which were recorded as part of the Sgt Pepper’s sessions, as a double a-sided single. Just a couple of weeks after Sgt Pepper’s was released, The Beatles recorded All You Need Is Love. The boys — Ringo was just turning 27; John was 26, Paul was about to turn 25, George was 24 — were on a hot streak. Of course, Paul McCartney will turn 75 this month. But 50 years ago he was already dead, and long-standing research shows that Sgt Pepper’s provided the proof we’d have confirmed by the Abbey Road cover, by way of very clear clues. To start with, there’s a new band with one Billy Shears as the singer (well, Ringo is Billy Shears, but let’s not have Failing Fake News disturb us). In A Day In The Life John sings: “He blew his mind out in a car”, indicating the method of Paul’s death. And if you play the song backwards, you apparently can hear the phrase, “Paul is dead, miss him, miss him”. At the end of Strawberry Fields Forever, John says, “I buried Paul”. Lennon claimed he mumbled “cranberry sauce”, but why would he say “cranberry sauce” when Paul is dead and he buried him? Wake up, sheeple! And then there’s the cover. In the foreground is clearly a grave — Paul’s grave! Look at the wax figure Young Beatles: Ringo is sad, very sad, as he looks at Paul’s grave. John is putting a comforting hand on Ringo’s shoulder (George seems glad though. Was he involved in the plot to kill Paul?). On the back cover, “Paul” turns his back; even Fake Paul is trying to give us a clue, apparently trying to escape the conspiracy. And here’s the smoking gun: Place the cover in front of a mirror, and the words “Lonely Hearts” on the drum read, “1 ONE 1 X HE DIE 1 ONE 1”, as you can see very clearly below. It’s so obvious, folks. So happy birthday to you, Sir Paul McCartney, whoever you are! Which brings us to this selection of cover versions of songs from Sgt Pepper’s, in the proper sequence. The selection is eclectic, yet it all flows. You’d expect otherwise from a sequence that goes from psychedelic rock of Jimi Hendrix (recorded in concert in Stockholm) to bluegrass legend Earl Scruggs to soul singer Natalie Cole to rockers Status Quo to old comedian George Burns to folkie Richie Havens and so on. And still, it all fits together well. It helps that Scruggs isn’t banjoing the hell out of With A Little Help From My Friends, and that Natalie Cole rocks harder than the Quo, who sound more like Burns. On the LP, the closing song is the crowning glory. The same might be said here of War’s epic take on A Day In The Life. I have added covers of Strawberry Fields and Penny Land to the mix. The best cover of the former is that by Richie Havens, but he already features with She’s Leaving Home. In any case, Havens’ version has featured before on one of the many mixes of Beatles covers. Coming in at under an hour, the mix fits on a standard CD-R. Covers are included. PW in the comments section (the purpose of which is not really to declare passwords but for readers to say something). When I was 14 I heard Hungry Heart on the radio. It was familiar and yet unlike any other sound I had heard. Looking back, I think it was the keyboards, which I still think are key to giving the E Street Band that distinctive sound (along with Max Weinstein’s booming drumming and, of course, Clarence’s sax). So I heard Hungry Heart and straight after school on a snowy day in February 1981 I rushed to town to find the new LP by this guy Springsteen. On my way home on the bus I could hardly wait to play it. As I held my new purchase, I liked the look of the face that filled the cover. This guy looked like a rock ‘n’ roll Al Pacino. Justice for all! But before I could play the The River, I had an afternoon appointment with the optician who proceeded to shine a light into my eyes that virtually blinded me for a few hours. How auspicious that on the day my relationship with Bruce Springsteen began, I was blinded by the light. I played sides 1 and 2 of The River to death. I rarely played the second disc. That first disc was perfect. With time I would become familiar with Bruce’s four previous albums, and come to regard Darkness On The Edge Of Town as one of the greatest LPs ever made. My loyalty to Springsteen began to waver in the 1990s, in as far as I didn’t rush out to buy every new album. But I have most of them. So I was excited to read Springsteen’s autobiography. My biggest problem with it was the title. Could nobody come up with something less predictable than Born To Run? I like to think the title “Cars And Girls” would have been a great, even if very belated, riposte to the cutting Prefab Sprout song of that title from 1988. But that is my biggest gripe. 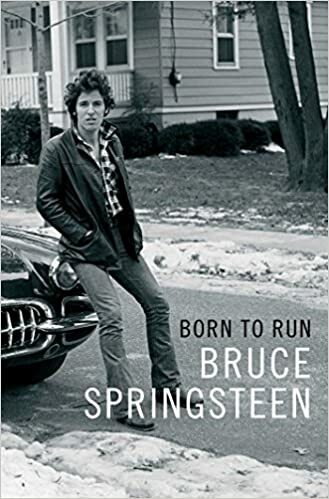 Born To Run mostly confirms that with Bruce, what you see is indeed what you get…mostly. I didn’t know about his battles with depression, and commend him for speaking about them with such honesty. I did know that Springsteen is a funny guy. Some of his songs are good comedy; take, for example, Sherry Darling. The book has some laugh-out-loud moments, such as when he describes his moves with Courtney Cox in the Dancing In The Dark video as “white-man boogaloo” and “dad dancing”. Springsteen mentions a few memorable concerts he has played. To my delight, all three Springsteen gigs I have attended are included. His Wembley concert on 4 July 1985 might be the best of any act I have seen. But I don’t want to write a book report on Born To Run, much as I recommend it. It rather serves as an intro to the mix I am presenting here: of covers of Springsteen songs. And it might seem easy to cover Springsteen. Manfred Mann’s Earth Band did so with Blinded By The Light. Patti Smith had a hit with Because The Night, and The Pointer Sisters with Fire. But Mann had his hit before Springsteen was famous, and our man hadn’t yet recorded the Smith or Pointer Sisters hits (the latter itself a cover of a record by Springsteen pal Robert Gordon, who sang it like Elvis might have). It’s quite different covering Springsteen songs after Springsteen has recorded them, almost invariably producing the definitive version (differently to Bob Dylan). That is, I suppose, why so few dare to do that. It’s a risk, and it doesn’t always pay off. So, in absence of an abundance of any more quality choices, there most certainly will be no second mix of Springsteen covers. As ever, the mix is timed to fit on a standard CD-R and includes home-bossed covers. PW in comments. Rock ‘n’ roll was invented when Marty McFly’s 1980s guitar solo of Johnny B Goode compels Marvin Berry to phone his cousin Chuck for inspiration for the new sound the latter was seeking. The obituaries for Chuck Berry noted his huge contribution to the rise of rock ‘n’ roll. Along with Ike Turner — another nasty individual who, like Berry, is best remembered only for his music — Chuck Berry is often cited as Exhibit A in the claim that rock ‘n’ roll is the white man having stolen the music of the black man. The argument has merit in some ways — the many hit cover versions by white artists of tracks first recorded by black artists or the exploitation of black musicians by record companies in the ’50s being cases in point. But it doesn’t hold true for the development of rock ‘n’ roll as a musical genre, which from the start was subject to a broad sweep of influences and served as a broad church of musical styles. And that finds concrete expression in Chuck Berry’s debut hit Maybelline, the record some regard as the birth of rock ‘n’ roll as a thing. And in a way it was: Maybelline was the first rock ‘n’ roll record performed by a black musician to break into the Billboard Top 10. Berry himself said that he had based Maybellene on country legend Bob Wills’ vocal version of the traditional fiddle number Ida Red, recorded in 1938. The foundation of Maybelline was country, but the building was rhythm and blues. In varying formulas, that was the architecture of rock ‘n’ roll. Of course, Wills’ Western Swing sound was itself a fusion — the white music we now call country incorporating black musical forms — which led Wills to claim that he did rock ‘n’ roll two decades before anyone, but that’s another story. The idea that rock ‘n’ roll started as a “big bang”, ascribable to individuals, or a select groups of individuals, or even a particular point in time, is absurd. The genre, which itself is so diffuse, was the result of a relatively slow evolution. Music that sounded like rock ‘n’ roll was already made more than a decade before Maybelline or Rocket 88. Just listen to Buddy Jones’ Rockin’ Rollin’ Mama from 1939 on A History of Country Vol. 3: Pre-war years – 1937-41. My proposition is that rock ‘n’ roll wasn’t so much a musical genre than a social movement. And for that a series of big, small and tiny bangs were needed. Chuck Berry being the first black R&B musician to cross over into the Billboard charts was one such seismic moment. Rock Around The Clock and The Blackboard Jungle, Tutti Frutti, Elvis on Ed Sullivan, perhaps even the death of James Dean were others. Chuck Berry, influencing some white kid in England…or Hill Valley. So Chuck Berry of course does occupy a central place in the history of rock ‘n’ roll. And other than Elvis, a good case can be made that Berry most influenced the post-war kids who would lead the British invasion in the 1960s — though he was by no means the only one, so the equation that without Berry there’d have been no Beatles or Stones is poor arithmetic. Unlike Elvis, Berry wrote his own songs, and this is the subject of this mix: 26 covers of tracks written by Chuck Berry between 1954 and 1970 (the mix is a result of me taking the bait from regular reader and radio presenter Martin). What is striking is how few black artists covered Chuck Berry. On this mix I count three. Three other shortlisted covers by black artists — Wilson Picket, Robert Cray and Aaron Neville — didn’t make the cut. Similarly, very few women covered Berry (which the old misogynist might have been pleased about). Which raises the question: Is Chuck Berry music the soundtrack of white maleness? Answers on a postcard, please. Of my joint-favourite Berry songs, one is covered as one would expect it and as it has to be by the Beach Boys. The other, however, sounds nothing like the original. Taj Mahal does interesting things to Brown-Eyed Handsome Man, though I still prefer the original. I never had much of an opinion either way of Too Much Monkey Business, but Leon Russell’s version here is exquisite — one of the few instances where the cover of a Chuck Berry song is much better than the original. My choice for the cover of Memphis, Tennessee was obvious — even if I still like Johnny Rivers’ take the best — and there was only ever one choice for Rock And Roll Music. I expect that here and there somebody will regret that I left out some song or other (I’m adding on four bonus tracks that very narrowly didn’t make it on to the CD-R), but one song that I was not going to leave out was the b-side for Maybelline, covered here by Trini Lopez — on the title of which Chuck is declaring his future intent. Alas, I found no suitable cover of a Chuck Berry song by his lyrical heir, Bruce Springsteen. But I can recommend that, if you are Springsteen fan, you join in the fun with the crowd in Leipzig, Germany, in 2013 on You Can Never Tell, the Berry song that seems to have been written for Springsteen and his E Street Band. As always, the mix is timed to fit on a standard CD-R and includes home-duckwalked covers. PW in comments. It has taken a while for Volume 3 of the Dylan covers to appear — longer than it took for Dylan to respond to the Nobel Literature committee. As it stands, there will be two more Dylan cover mixes after this. The fun thing about compilations of Dylan covers is to play off the featured versions against the originals: which one is better than the other? In some cases it’s a difficult exercise because the respective versions have their own merits. How do you compare Dylan with Tina Turner? But for me the surprise winner in this game is Mike Stanley, who turns one of my least favourite Dylan arrangements (and I know I’ll make many eternal enemies and absolutely no friends for thinking so), Subterranean Homesick Blues, into the great song it is. Stanley’s eponymous 1972 album featured the likes of Joe Walsh, Todd Rundgren, Joe Vitale and Patti Austin, but somehow he failed to make it really big in the mainstream. He is still recording, but is also a popular DJ in Ohio, and appeared as himself on The Drew Carey Show. Of course, many Dylan songs are so quintessentially Dylan that they cannot be bettered, no matter how good the cover is. Like A Rolling Stone, covered here with imagination by Major Harris, is one such song. Check out the Song Swarm of it; there are many good attempts, but Dylan inhabits the song so much that everything else is just a copy. Frankie Valli doesn’t even try to give Queen Jane Approximately his own voice: he sings it like a Dylan parody. Dylan recorded Queen Jane Approximately on the same day as Just Like Tom Thumb’s Blues, which features here in Gordon Lightfoot’s version (a face-off Dylan wins handily). Lightfoot scored a #3 hit with it Canada in 1965, shortly after the song appeared on Highway 61 Revisited. Bob Dylan is a great Lightfoot fan, having once said that when he heard a Lightfoot song, he wished “it would last forever”. As always, the mix is timed to fit on a standard CD-R and includes home-strummed covers. PW in comments. Anyhow, the first mix attracted a fair number of comments. Some of them addressed one of the great debates in pop history: is Bob Dylan’s voice an instrument of art or is it a punishing aural assault? It’s the kind of question that provokes internecine warfare even between Dylan fans. My view? I think Dylan’s voice is, in itself, quite unpleasant. In most other artists, that nasal whine might be considered objectively offensive — even Trump supporters, who enthusiastically embrace the objectively offensive, would find it offensive. His lower register on the country-flavoured albums — on songs like Lay Lady Lay and Just Like A Woman — is more tolerable, but you’d be hard-pressed call it beautiful. But the tone of his voice, however you perceive it, is not really important. Indeed, one can acquire a taste for it, just as people acquire a taste for things as revolting as tequila, broccoli or mayonnaise. What is important is how Bob Dylan uses that voice. At his best, Dylan doesn’t so much sing his songs as he inhabits them — and that is the mark of a great singer. In so many of his songs, his vocals not only drive the narrative, but they are a character in it. That works best when Dylan has a stake in the songs he sings. There are very few singers who can spit venom quite as Dylan. In Hurricane, that anger is on the verge of boiling over; but this is not just anger. With his delivery, with the encunciation of single syllables, he also communicates an utter contempt for the system which he is singing about. The effect is devastating; no other singer could do Hurricane to such great effect as Dylan does it. What does it matter that his voice isn’t lovely? Likewise, the menacing derision for the subjects of his contempt which he conveys in his vocals on mean-spirited songs like Positively 4th Street, Ballad of A Thin Man or Like A Rolling Stone hits you in the gut. Not many singers can do that. Dylan might have an ugly voice, but he has an extraordinary way of delivery — especially, as I’ve said, when he is invested in the words he is singing (which might explain why few of his covers of other people’s music are particularly outstanding). To be sure, there are also many Dylan songs which are immeasurably improved by cover versions. One such song is All I Really Want To Do, from Dylan’s 1964 LP Another Side of Bob Dylan. I really like Dylan’s version, especially the idea of a songwriter laughing at his own lyrics. But in The Byrds’ version, a comprehensive reinvention, the song becomes a thing of special beauty. As does the lovely Every Grain Of Sand, which is okay when sung by Dylan, but sublime in Emmylou Harris’ treatment. And this is the genius of Bob Dylan’s music: as it is with Beatles songs, they can be interpreted and reinvented them to good effect in so many ways. This second collection of Dylan covers testifies to this. Incidentally, in the first post of Dylan covers I promised three mixes. Clearly, that is not enough. I’m up to five mixes now. A few years ago a reader suggested that a mix of cover versions of sings by Bob Dylan might alleviate the discomfort many feel at hearing the great songwriter’s voice. As a fan of cover versions I was keen on the idea. So I created a Dylan covers folder and began collecting. Something like eight years later I’m ready to present a series of Any Major Dylan Covers. This will be a series of three CD-R length collections — 62 songs plus three bonus tracks. As always, I set myself strict rules: no artist may feature twice, and no song may be repeated — except one, which will end the series. Since these are supposed to be covers of Dylan songs, he must have released the songs first. That means that those tracks he wrote for others, or which others recorded before he released them, don’t qualify — except two, which I’ll address in a moment. A song like Blowin’ In The Wind might have been recorded first by others (Dylan historians have no consensus on that), but it is so essentially a Dylan song that it can’t be excluded. Dylan never released Wanted Man before it was first recorded by Johnny Cash on the St Quentin live album. So it isn’t really a cover. But it broke my heart to consider not including a Dylan/Cash hybrid, so — in best Cash fashion — rules be damned. In the spoken intro Cash says he wrote the song with Dylan at the Cash home, but Dylan has the sole writing credit. Anyway, the great list-song writer has his lyrics performed by the great list-song singer. But Dylan has also said that the version of any of his songs he treasures most is Elvis Presley’s 1966 interpretation of Tomorrow Is A Long Time, a song Dylan recorded in 1962 but didn’t release until 1971 as a live track from eight years earlier. So Elvis’ version isn’t really a Dylan cover, but rather of the folk singer Odetta’s recording. But how great is Kris Kristofferson singing Quinn The Eskimo? Which brings me to two acts who are notably excluded in this series: Odetta and Peter, Paul & Mary had a great reputation for singing Dylan songs (Odetta, in turn, was something of a mentor to the budding songwriter from Minnesota). Their exclusion was not deliberate: where I had candidate songs by them, there were others which were a better fit. Mr Tambourine Man is covered here by Johnny Rivers — so I’ll leave you to wonder which Dylan cover by The Byrds will feature in this series? And what will we have Joan Baez singing? And whose version of Blowin’ In The Wind will feature? The mix is timed to fit on a standard CD-R and includes home-busked covers. PW in comments (you are welcome to leave a message there). There is a sweet irony in the cover picture of The Rise and Fall of Ziggy Stardust and the Spiders from Mars: the alien superstar is photographed in a seedy sidestreet, not a glittering glamour spot, of London’s West End. Instead of shining brightly in a metallic science fiction wonderland, the monochrome photo is hand-coloured in the way of postcards from the turn of the last century. The cover holds not the promise of the story we are coming to hear, but its denouement: Ziggy has come back down to earth as David Bowie. There’s trash, there’s rain, there’s a bin, there’s the sign of the furrier K. West, where the fiction of left-handed Ziggy and the fact of Bowie, holding his guitar right-handed, come together. Or that’s how I choose to see it. The story of Ziggy Stardust is vague enough to let you project your own ideas on it. In fact, by writing about the cover, by stripping away a veneer of its mystique, I may be depriving you, if you do not know the story of the cover, of your ability to freely project. Read on at your own peril. What we will find is that the story of the cover is rather… ordinary. The photo was taken on a cold January night in 1972 in Soho’s Heddon Street, then an insalubrious sidestreet, but today a fashionable pedestrian zone. The photographer was Brian Ward, who had studio in the street. He took 17 photos that night, including the back cover shot of Ziggy/Bowie in the telephone booth. The front cover pic was taken at house number 23, under the big sign for K. West. Apparently Bowie turned up (with a posse of two girls), posed for a few minutes, and quickly disappeared into the rainy night, leaving Ward to develop his black-and-white photos. The winning shot was colourised, giving the jumpsuit a blue hue when it was, in fact, green. You can see the jumpsuit in real life on this clip from the Old Grey Whistle Test in February 1972. Have look at all 17 photos of the session at the Five Years site (from which I’ve borrowed one here). And if you feel that Bowie was wrong as Ziggy, and it should have been your mug on the cover, well, that can be arranged HERE. So, to mark the Ziggy cover here’s a mix of Ziggy covers. Every track off the album is performed in sequence by various artists — and two by Bowie. One is from the famous Hammersmith Odeon concert at which he killed off Ziggy Stardust — obviously the final track, “Rock ’n’ Roll Suicide” — the other a new mix of the largely uncovered “Star”. In fact, there’s a third Bowie number: The Arnold Corns was a Bowie project on which he test-drove some Ziggy tracks a year before he gave birth to the alien superstar. One song on the album, of course, was a cover itself: “It Ain’t Easy” was a Ron Davies song. The cover of that on this mix also precedes Ziggy.